How to turn a trade show into a lucrative investment for your yoga retreat and training businesses. Note: This case study is based on beauty wellness industry but equally applicable to any yoga business in search of newer ways of growing clients. In 2009, I used at least 15 different ways to promote my new yoga business. 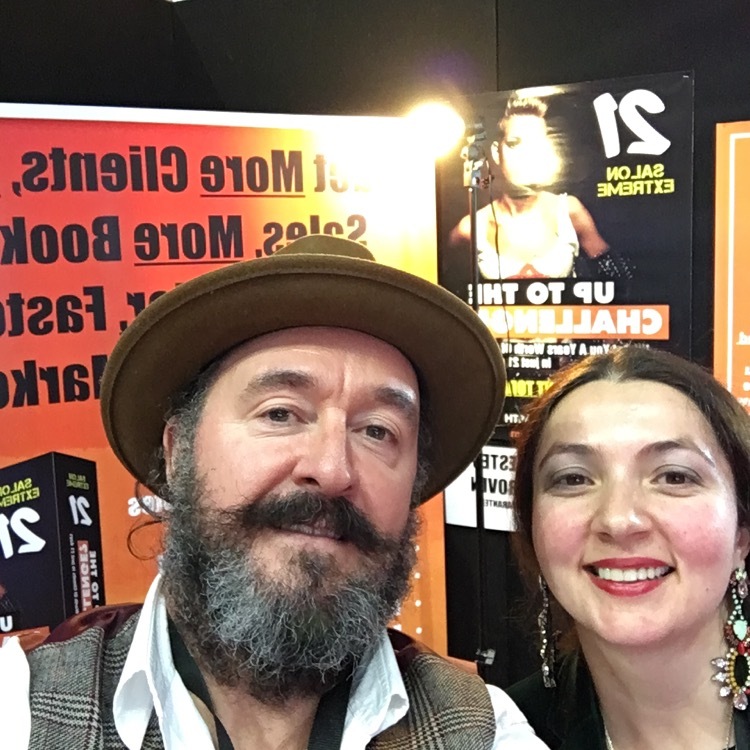 From live training to free events, workshops, online classes, newsletter marketing, print magazine advertorials, radio shows, interviews, phone calls, face to face meetings, blogging, writing articles, direct mail letters you name it I was doing them all. It was busy but it also felt being in the flow, cool and the results showed. Shortly after, I moved on to other industries, servicing hair salon and beauty industry became an extension of already established Yoga Business Academy, and shortly after that, we extended further into servicing businesses from solicitors to cyber security companies and the rest. As I was getting busy servicing others, I started to slowly limit my own business marketing efforts… In a way became a bit complacent until I found myself working almost exclusively behind the keyboards, marketing and advertising was done almost 100% online. Frankly, I did not like it. It almost felt like being held behind the bars, typing away. So in 2016, I decided it was time to change and go offline. We booked our first live trade show for hair and beauty industry in Manchester which took place last weekend. We were going to sell and exhibit a new salon owners marketing manual. We did not really know how well we would do and frankly we did not expect any sales at all, but we knew exposing the business in front of 7000 salon owners was a good idea. Trade fair was something I had no previous experience at. If you have ever done a yoga trade show you know it can cost a little fortune, but the brands that were exhibiting in the same show as us had clearly spent a big fortune, they were not merely building stalls for the show, they were building spaceships and the 21st-century shops, every detail was glammed up to the perfection. If I had to guess some brands spent easily between £50-100K putting up the stalls. OK almost everything we took with us was sold out, we came back home with just 3 ex-display manuals which were also sold the next day from our online salon shop. And beyond selling on the day we created an opportunity to build relations with over 7000 ideal contacts. It was not an accident that we were sold out and frankly despite the appearances we’ve done what business should do in order to remain in business – focussed on sale. So here are the lessons we’ve learnt from the show that you could also use in your own yoga business. Despite the appearances, we were prepared for sale. We had posters made, but they were not just posters, they were carefully crafted sales letters, every word was designed to speak to prospects, raise curiosity and sell. We could have created pretty Hollywood type posters but that would not sell. Instead we focussed on the benefits, benefits and more benefits. I can tell you at the end of the show many brands that clearly spent fortune sold almost nothing. But there were many that never stopped selling until the doors closed. Or do you need to grow the business? You see sometimes selling is not the priority. Many brands do not expect to sell anything during the exhibition, but it is still important to be seen by the prospects, as that exposure contributes to their overall revenue stream. But if you are a small yoga business with no luxury of dedicated annual ego budget, you need to sell. It’s so easy to overspend on… everything. You want the presentation to be sleek, if you have yoga products you want it to be packaged and branded, the stall should stand out etc, which means by the time you are done organizing the stall you could spend thousands and thousands. Of course, it’s important to invest, but until you tested the market make sure it’s you that control the costs and not the show you are participating in. In our example, because the show was a test, we did not want to invest a fortune in product packaging etc, so one of the things we did to save was I ordered on eBay brown bags in bulk, printed the logos on sticker papers and spent an entire evening sticking them on the paper bags. If you can’t make something to look glam use your creative imagination to solve the problem. Typically trade show organizers do most marketing, but you should not rely on that alone, let your own customers know you will be at the show. From social media advertising to newsletter marketing let your own prospects know when and where they can meet you in person. It was amazing and lovely to see how many people came to our stall to say hi as they’d come to meet us in person. questions, listening to your customers and smiling. Friendliness goes a long way. If you are advertising yoga industry show special offer make sure you do your work. The website needs to be updated, the special offer needs to be created, product or service fulfillment should be sorted out, whoever is doing the selling they need to know and understand what you have to offer. For example, at the show we made one mistake, we wanted to create a prize draw, which was a good idea, but we had not done the job properly and did not have the system of getting clients to enter the competition. The outcome? no one entered the competition. So we learnt. It is tempting to print loads of yoga flyers to hand over. What happens next? It is estimated that well over 90% ends up in the bin. Instead, create flyers that would encourage people to come back to your stall on the day. Special trade show offers, one day deals, really helpful incentive to attract people to come back to your popup shop on the day is more important than handing out general flyers and hope for the best. Ok you take some cash, you break-even and make a little profit. That’s nice, but that is only the beginning. Unless you have a plan to build relations with people you meet, there is no continuity in sale and revenue. That’s why you need to look after the database. Make sure you are collecting the permission-based database on the day and have a really good plan to build relations with the prospects, money and sale are the natural byproduct of the job done well and the relations you build with people. If the show is a success for you, keep the momentum going. Reinvest, participate in another show, start using another form or marketing, social media can work wonders IF and only IF done properly. You can attract tons of clients through Facebook and Google advertising if you know how to read your target market and promote your business. Did the feeling last long? Not really. If you know your subject inside out. If you understand the service you offer, if you have the confidence in the benefits your products can deliver, and have the savviness that only small business owners can have, there is no other large brand or established business that can overshadow your service. Speak from the heart and people will listen, that’s the best advertising you can have.